Romania President Iohannis gives green light to criminal inquiry into ex-leaders in 1989 Revolution case ​Romanian President Klaus Iohannis on Friday sent a request to the Justice minister for the launch of a criminal inquiry against former president Ion Iliescu, ex-PM Petre Roman and another former official, in the case of the 1989 Revolution. The Prosecutor General charges the three with crimes against humanity. Annual inflation rate up to 5% in March, highest since June 2013 Romania's annual inflation rate rose to 5% in March 2018, up 0.3 percentage points from the previous months, reaching the highest level since June 2013. Romanian MP targets management of intelligence services with several bills An MP for the governing Social Democrats (PSD) has submitted four bills eyeing the management of the intelligence services, as the PSD leadership has become more vocal about the intelligence community, prompting debates about apparent moves to subdue them politically. GRECO Report: Council of Europe anti-graft body says its deeply worried about changes to Romanian justice laws, calls on Romania to abstain from other changes that may affect fight against corruption The Council of Europe group of states against corruption (GRECO) says in a report published Wednesday that it is deeply worried about the laws that the Romanian Parliament adopted recently, to change the legislation on the statute of magistrates, on the judiciary system and the Superior Council of Magistrates, as well as about bills to change penal law in the country. A representative of a US-based company involved in a deal linking Romanian politics to Cambridge Analytica says he supported visit of current Romanian ForMin to Washington / Minister denies Charles Andreae from the Andreae&Associates company, contracted by SCL, the umbrella company of Cambridge Analytica, for a Romania-related project recently, says he was employed by SCL to contribute to the organisation of a visit by Romanian Foreign minister Teodor Melescanu to Washington, according to RiseProject.ro. ​How a Chinese man considered "threat to national security" in Romania accessed strategic company Cupru Min Wang Yan, a Chinese businessman who had his Romanian citizenship withdrawn for national security reasons several years ago, managed to reach the headquarters of Romanian copper company Cupru Min, a strategic state-owned company, in November 2016, according to information obtained by HotNews.ro. A year later, he obtained Cupru Min's whole production for a Hong Kong-based company, as journalists at Tolo.ro revealed earlier this week. Romania key copper company Cupru Min has sold all production to Hong Kong co. represented by man eyed by intelligence service over ”national security threat” Romanian copper company Cupru Min, owner of 60% of the country's copper reserves, sold all its production to Hong Kong-based company Merlion Resources, which is represented by Wang Yan, a controversial businessman whose Romanian citizenship has been withdrawn several years ago, Tolo.ro reports. The citizenship withdrawal had been requested by the Romanian Intelligence Service over ”threats to national security”. Romanian anti-terror prosecutors investigate Romanian of Palestinian nationality for promoting terrorism and accessing documentation on how to launch terror attacks Romanian prosecutors dealing with terrorism and organised crime (DIICOT), notified by the Romanian Intelligence Service (SRI), are investigating a Romanian citizen of Palestinian nationality under suspicion of promoting propaganda specific to terror groups in the Middle East and training in using explosive materials, the DIICOT has announced. ​Businessman Alexander Adamescu, attempting to dodge extradition from Britain to Romania, arrested in London Romanian businessman, Alexander Adamescu, son of late businessman Dan Adamescu, was arrested in London on Monday night, almost a year after the Bucharest Tribunal issued a preventive arrest warrant on his name, Police sources have told Romanian news agency Mediafax. Newspaper Libertatea, quoting judiciary sources, says he was arrested after a London court found he used fake documents while facing a case in which he has been trying to dodge extradition to Romania. Romania's governing party brings up two controversial topics: referendum on definition of family, talks on introduction of civil partnerships Representatives of the government and the governing parties brought up a hotly debated topic on public agenda on Monday: a planned referendum to redefine marriage as a union between a man and a woman. Also on Monday, the leader of the governing Social Democrats, Liviu Dragnea, announced interest in discussion of another polarising topic - the introduction of civil partnerships. Bloomberg: Schweighofer sells forests owned in Romania to Swedish group GreenGold Austrian group Schweighofer is to sell the forests it controls in Romania to Swedish investor Greengold Asset Management AB/KB, according to Bloomberg. More precisely, it sells the Cascade Empire company and the "Ocolul Silvic Cascade Empire", which together hold 14,283 hectares of forests in northern Romania, according to a Schweighhofer statement on Monday. Russian diplomat to Bucharest declared persona non grata in Romania The Romanian Foreign Ministry declared a diplomat of the Russian Embassy to Bucharest persona non grata in Romania, so he is forced to leave the Romanian territory. The announcement came as a wave of European countries, along with the US and Canada announced the expulsion of dozens of Russian diplomats in the wake of the Skripal case in Britain. PM Dancila uses different wording in Romanian and English versions of letter to EC President Juncker: harsh approach in version for local media, mild one for official recipient Romanian prime minister Viorica Dancila sent a letter to EC President Jean-Claude Juncker on Wednesday, requiring "urgent clarifications" about alleged meddling by the Commission on high profile corruption cases in Romania. 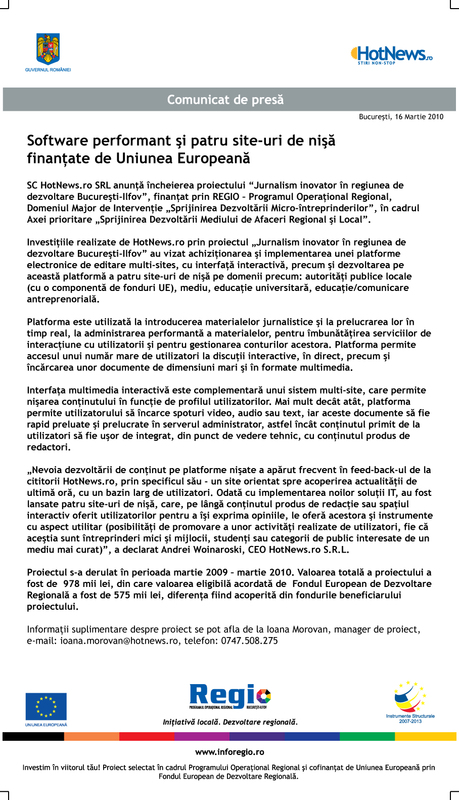 But in doing so, she also sent a Romanian-language copy to Romanian media, which bears significantly different, stronger wording than the English-language version, as noted by journalist Liviu Avram of newspaper Adevarul and by HotNews.ro readers. ​British consultant Rupert Wolfe Murray speaks out on contacts with Cambridge Analytica over Romania involvement A British consultant, Rupert Wolfe Murray said on Wednesday as quoted by AP that prior to the 2016 general elections in Romania he had been contacted by a top official from Cambridge Analytica, the company at the center of the ongoing scandal on abusive use of Facebook data. House of Deputies adopts hastily corrected Justice laws A special parliamentary commission tackling changes to Romania's laws of the judiciary, which have sparked massive protests, concluded on Tuesday the last round of modificiations to articles of their work which the Constitutional Court has found to be unconstitutional. The reports on the corrections were finished in less than an Hour and went to a final vote in the House of Deputies. They were all adopted with the support of the governing PSD and ALDE parties and the Hungarian Democrats. Romanian Foreign Ministry opts for non-involvement in controversy over visit of former PM to Moscow Romania's Foreign Ministry stated on Monday that a recent conference that took place in Moscow, with the participation of ministry officials and former PM Adrian Nastase, was not supported financially or organisationally by the governmental institution. The conference sparked controversy in Bucharest, as pictures appeared depicting ex-PM Nastase in the company of prominent Russians close to Kremlin policy making, prior to the presidential poll that saw the re-election of Vladimir Putin. Romanian parliamentary commission brings changes to provisions of Justice laws that were found unconstitutional A special parliamentary commission tasked with changing the Laws of Justice adopted on Monday a series of additional changes to the provisions of the amended laws which the Constitutional Court has found to be unconstitutional. Initiative to allow territorial autonomy for Szeklers' Counties enters parliamentary debate in Romania A Romanian House of Deputies commission will on Tuesday launch the debate on a bill initiated by a Democratic Hungarian (UDMR) MP on the territorial autonomy of the Szeklers' Counties - the Romanian counties with a large Szekler (ethnic Hungarian) community. The bill proposes a return to an administrative organisation that includes a local president, parliament and government, with Hungarian language admitted as official language along the Romanian language. HotNews.ro editor-in-chief Cristian Pantazi, coordinating editor Dan Tapalaga leaving newsroom. Their messages to readers Cristian Pantazi, editor-in-chief of HotNews.ro, and Dan Tapalaga, coordinating editor at the website, on Tuesday announced their leaving the newsroom to launch their own editorial project. Here are their messages to readers. EXCLUSIVE Romanian President's name considered in Brussels for president of European Council The name of Romanian President Klaus Iohannis is taken into consideration in Brussels for the seat of European Council president, currently held by former Polish PM Donald Tusk, several political sources have told HotNews.ro for the past several days. They said it was not clear whether President Iohannis was interested in the job, but he was certaintly supported among European officials who have started preparations for accepting Iohannis as Council head.